Ben dyes his hair neon, grabs a buzzsaw and prepares for the Pink-ocalypse! The Far Cry series has its first direct sequel, and what an odd little beast is. The development questions almost outnumber the gaming ones: at what point in the production of Far Cry 5 did they decide they were going to make it? 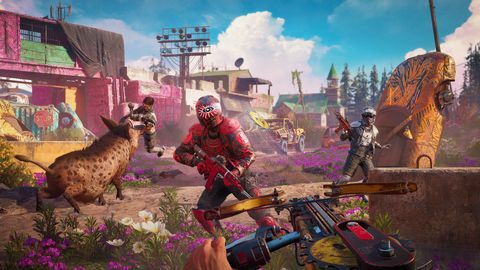 How hard is it to visually reskin an existing Far Cry map? Are we going to get more of these branching off entries of future numbered instalments? Anyway, let’s forget all that for a minute and get back to re-visiting Hope County. Editors Note: Story spoilers for Far Cry 5 below. You've been warned. Hey, remember Far Cry 5’s kind of terrible ending, where murdering mad preacher bad guy Joseph Seed was actually right and the apocalypse he predicted turned out to be a nuclear war that happened? 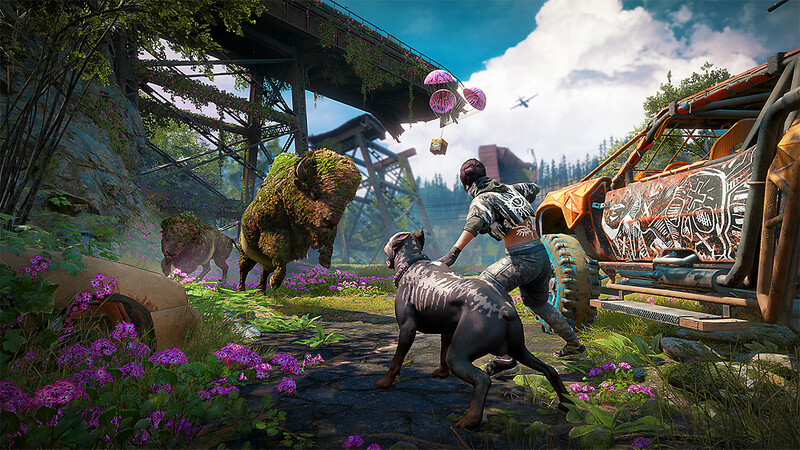 Far Cry: New Dawn picks up a couple of decades after the missiles dropped, with the player character part of a civilization-rebuilding team on a train headed to assist a group of survivors in Hope County. Things are not going to go smoothly, of course. Another group with a significant presence in Hope County are the Highwaymen, led by twin sisters Mickey and Lou. They have elected to whole-heartedly embrace the Mad Max, plunder-others, value-life-cheaply vibe post-apocalypse, and attack the train, leaving you and local Carmina Rye pretty much the sole survivors. From here it’s back out into Hope County - now considerably-more-irradiated - on a mission to rebuild and protect the peaceful survivor community from the depredations of the Highwaymen. By now, the mutated nuclear wasteland aesthetic has been covered pretty strongly in gaming (some might even say it’s been done to death) - so New Dawn opts to take a slightly more realistic (if perhaps optimistic) view of a post-nuclear world. 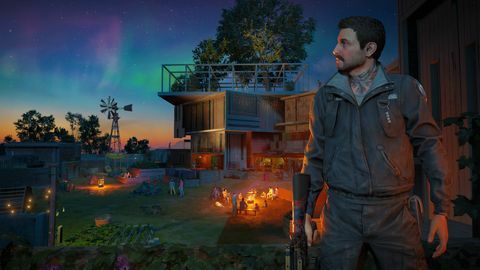 Far enough away from cities to escape the worst damage, Hope County shows scars of nuclear conflagration, but generally has more of a 'nature left alone to get on with it' look going on. Radiation exists only to stop you from going off the edge of the playing area. 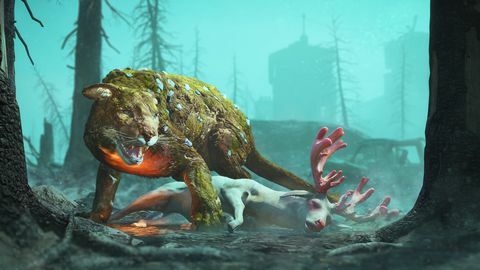 A new bright pink bloom dominates much of the landscape, growth is still plentiful, and animals thrive, with mutations more along the lines of 'this trout is a different colour now' than extra limbs or sudden gigantism, with the exception of a few legendary cougars or bison. It’s also worth noting that somehow nuclear war brought crocodiles to Montana. (I have some questions.) In some ways, it’s a refreshing change to the “standard” post-apocalyptic feel we get from a lot of media, but in other ways feels a bit half-arsed. Your arsenal for example now offers a saw-blade launcher, which feels like a genuinely-cobbled together weapon, but the rest of your arsenal is familiar stuff along the lines of 'an AK47, but with a screwdriver duct-taped to the end of it', which seems a little lazy. 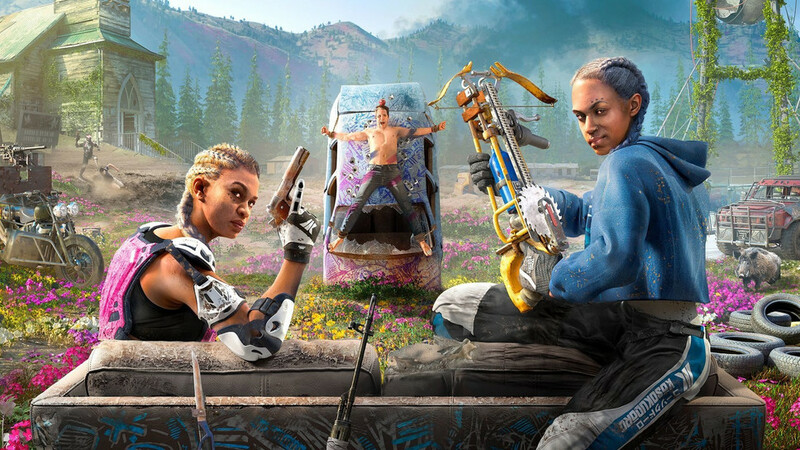 Sequels are always a case of “more x”, but the easiest way to describe the gameplay in New Dawn really is “more Far Cry”. You’ll be taking down enemy strongholds either by stealth or guns blazing and lobbing meat everywhere to summon an army of wolverines, puzzling out treasure stashes, and unlocking companions, both animal and human, to follow you into battle. It's as solid as ever. The trick this time around is that rather than giving you the freedom to roam all over the map, the game has more of an RPG-progression feel, complete with damage numbers and areas full of enemies that you won’t be adequately equipped to take on without sufficient in-game progress. Expect to experience that uniquely weird video game feeling: emptying clip after clip of automatic rifle ammunition into an enemy with negligible results, seemingly because they took the precaution of putting on some active sportswear. Defeating strongholds or hijacking tanker trucks on the road, though, gets you ethanol, which you can use to upgrade your home base and thus your abilities and weapons, finally giving your bullets enough power to penetrate a plastic motocross kneepad. This effective gating of areas is a bit annoying; a couple of times at least during the story missions, I had to stop trying to progress and go spend some time building my skills up in order to get tough enough, as if the game was telling me I couldn’t have my dessert until I’d eaten all my vegetables. Worse though, it cancels much of the “open world” feel that was one of Far Cry 5’s great strengths. Exacerbating the problem, the fastest way to get more ethanol is to cede a captured stronghold back to the Highwaymen and take it over again at a higher difficulty level, so you’re not really encouraged to strike out to look for new ones, and tend to play through the same ones quite a lot. The scope of the game can’t help but feel a bit pared back as a consequence. 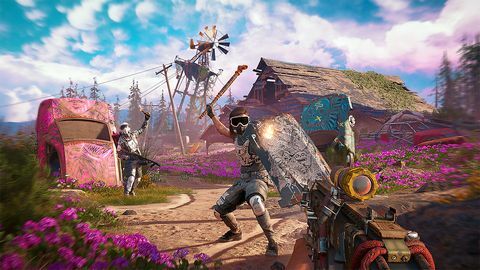 This measured-out progression also means that you get the game’s major addition to Far Cry gameplay - flat-out superpowers - rather late in the game. Again, you have to put in some work to get enough upgrade points for the ones you want, but they offer some fun new ways to tackle your regular suite of tasks, like double jumps, mega-punching, and biffing shields Captain America style. Their inclusion feels like the creative team taking the chance to add a fun experimental toolset to their weird little offshoot from the main series though, rather than implementing them deeply into the game. But it's nice to have the variety. there are lots of fun callbacks and references to find for those who have already explored Hope County once. The smaller scale affects the story too, which does the series’ usual good work with charismatic psychopaths and good performances, but all feels a bit rushed. There’s no time to really get to know people or form meaningful relationships over the twenty-odd story missions, in which the story has to cram in not only the whole new row with the Highwaymen, but also do all the work needed to be a continuation of the tale of Joseph and his Eden’s Gate worshippers. It just about strikes the right balance but doesn’t have time to truly expand on or explore things at all, making for obvious unanswered questions and big emotional moments that land with a thud. The more interesting story stuff is in neat sequel touches, most found off to the side when exploring the world. Carmina has a very direct connection to a mission in Far Cry 5; a helicopter you may remember shooting down lies where you left it, a rusted hulk; and even the fate of your player character from Far Cry 5 is explored. There’s so much of this stuff in there that’s it hard to imagine players coming straight to this game getting as much out of it, but there are lots of fun callbacks and references to find for those who have already explored Hope County once. As if in recognition that the main narrative is a bit lacking, New Dawn introduces Expeditions, a separate suite of missions positioned story-wise as supply raids on Highwaymen resources removed from the main location. 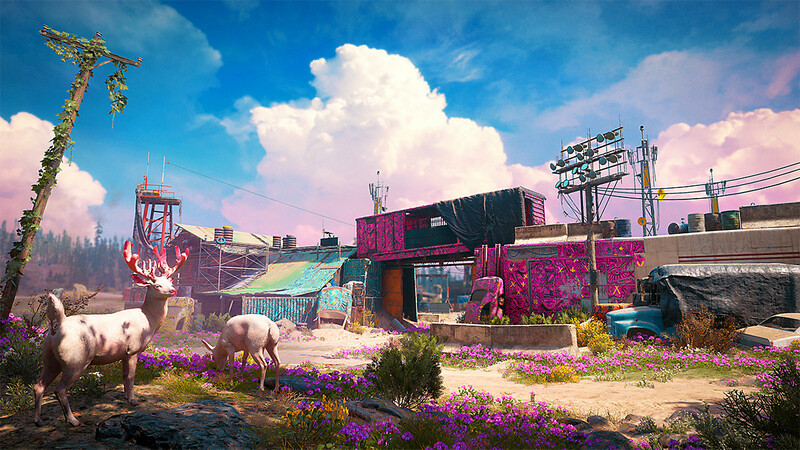 The primary reason for their inclusion feels like it was to let the creative team play around with other post-collapse environments and locations including a New Orleans theme park, desert bridge, and rusted aircraft carrier. They’re a neat addition, but always have the same objective - snatching a package, then hightailing it to a landing area and surviving non-stop enemies until your airlift arrives - so tend to play out pretty similarly. It’s a good mode to play in the series’ co-op though, which it seems almost designed for, and is a better use of a team-up than the occasionally fun but inessential messing about in the main world you can still indulge in with a friend. It may be harsh to judge an obvious cash-in style follow up for being a blatant cash-grab, though. 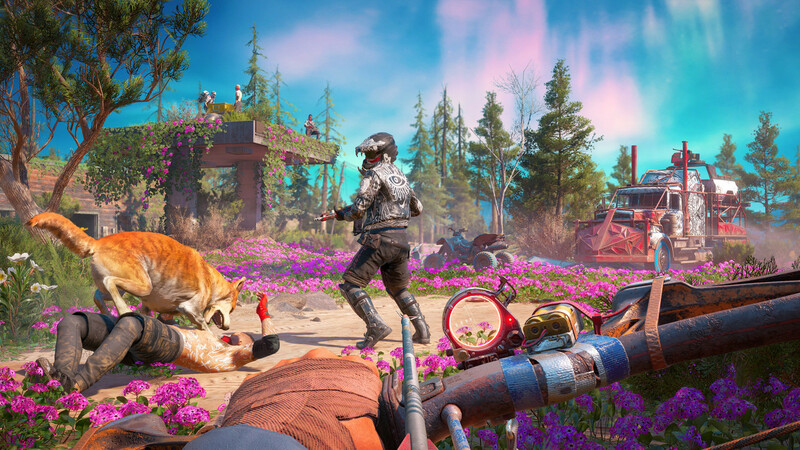 For big fans, Far Cry: New Dawn certainly succeeds in providing more of the same map-roaming gameplay the series is known for - commando-clears, vehicular mayhem, and “emergent narrative” moments, typically involving an angry bear. As a tide-over to the next major entry, it offers some fun, and narrative closure. If you only have a casual interest in Far Cry though, it's an easy one to skip. Ups More Far Cry, with most of the strengths of the series strong as ever. Plenty of neat sequel stuff/Easter eggs for those that played Far Cry 5. Superpowers are fun to experiment with. Expeditions add some scenic variety and are good for co-op. Downs Smaller scope loses open world feel and cramps story. Addition of RPG style mechanics not a winner. Themes and setting can feel only half-explored.